My friend Patty and I wrapped up a long week of work one Friday and decided to have a late lunch not far from our radio station. 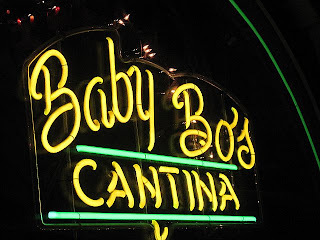 Knowing my love for margaritas, Patty led me to Baby Bo's Cantina on 2nd Avenue. Their lunch special is 7.95 for chips and salsa and an entrée. They had a good range of options, from vegetarian to seafood to beef and chicken. They also had a whole range of sauces, including chipotle! First things first, though: we ordered a half-pitcher of margaritas, which came out to almost 2 glasses each at a really good price (I didn't write it down, but it was cheaper than ordering individual glasses). 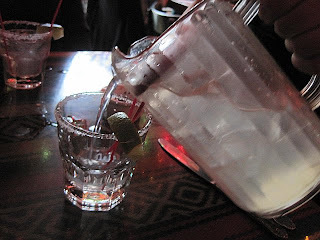 Of course, the pitcher is mostly ice, but the margarita was so delicious and super-chilled, it was totally worth it. I was hemming and hawing, not sure what to get, but quite sure I was ridiculously hungry. 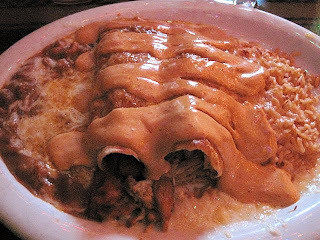 Our server didn't hesitate for a second when I asked her recommendation on which enchilada sauce to get: suiza (my go-to) or chipotle. She said their chipotle was excellent, and I jumped on it (again, it is one of my favorite flavors, so this wasn't much of a risk for me). Our food came out exceedingly quickly. 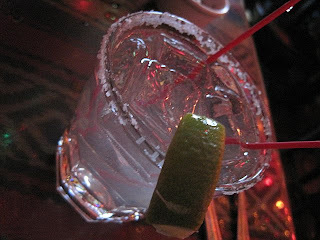 We'd already had a margarita, and banished our bowl of chips (amazing how many of those you'll eat if you leave it there!) so we'd have room. This was SO delicious. The chipotle was its usual smoky awesome self, and the chicken was soft and tender. 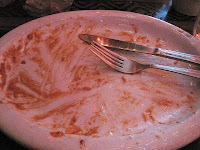 I ate every single bite of food on my plate, and have to photographic evidence to prove it. See? I even ate the RICE! 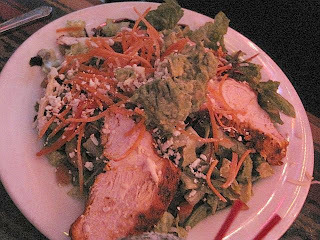 Patty got her usual--some sort of chicken salad. She was quite happy with it, and it did smell scrumptious. She offered me a bite, but I was pretty sure I'd need all available space for my enchiladas--and how! By the time we finished our entrées, our server was just about to finish her shift. 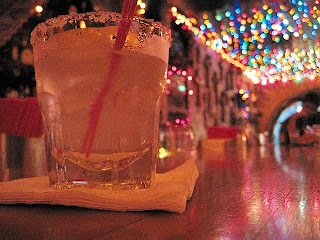 She told us they had an excellent Happy Hour special at the bar (4.50 for margaritas), and set us up with our drinks there before we left. She was super helpful! 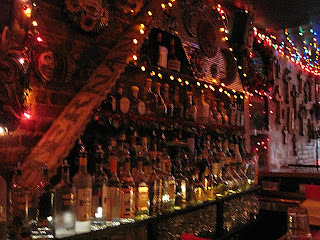 Patty and I felt completely relaxed and welcome, we never felt rushed, and we just took our sweet time at the bar, catching up and unwinding after a long, busy week. I will so be back. Yo voy a regresar a Baby Bo!